While countries around the globe are still mulling the risks – and experiencing the environmental backlash – of genetically engineered (GE) plants, biotech companies are moving on to the next targets – insects. The latest science project, courtesy of researchers from the University of California, is mosquitoes genetically engineered to stop the spread of malaria. In theory, the idea sounds promising, at least on the surface. The researchers injected Anopheles stephensi mosquitoes with a new DNA code that makes them resistant to the parasite that causes malaria. Further, a controversial “gene drive” technique was used that allows the “frankenbugs” to pass their resistant genes onto their offspring. In a recent study, 99.5 percent of the GE mosquitoes’ offspring carried the malaria-blocking genes.1 If the mutant mosquitoes are released into the wild, thereby mating with wild populations, their GE DNA would pass freely onto their offspring. The researchers believe this could theoretically stop mosquitoes from transmitting malaria to humans and ultimately eliminate malaria. “Gene drive” technology, which has been around for about a decade, allows scientists to not only insert specific gene mutations into DNA but also to ensure those modified genes get passed onto offspring. The technology leads to biased inheritance of the GE genes such that they may extend to entire populations. “Malaria is only the beginning. Geneticists have suggested other types of gene drives that could be implemented to solve the world’s problems. If we can design mosquitoes, we could eliminate invasive pests like the python in Florida, strengthen species threatened by global warming, and improve world hunger by growing more abundant crops. But the daydreaming is stunted by fears of unintended consequences and a disdain for ‘unnatural’ human intervention. What happens if newly introduced genes end up having unexpected long-term effects on a species? Or on other species that it might cross-breed with? What are the chances of an unexpected mutation? … Fears of the unnatural will certainly persist, but gene drive will change the conversation completely. In the case of GE mosquitoes released into the wild, people living in those areas have no choice about exposure – and neither do the other species they interact with. What happens, for instance, if a bat eats a GE mosquito? And what happens if one of the GE mosquitoes bites you? Will their GE DNA be injected into your arm or leg? These are questions that currently have no answers. Mosquitoes engineered to resist malaria are not the only GE mosquitoes that may one day be coming to your neighborhood. 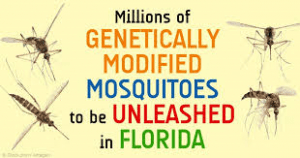 Biotech company Oxitec and the Florida Keys Mosquito Control District (FKMCD) have a plan to introduce GE mosquitoes to the area in an attempt to stop the spread of chikungunya and dengue, tropical diseases spread by Aedes mosquitoes. Ironically, FKMCD stated flat out: “Dengue fever and chikungunya are currently not an active health threat in the Florida Keys.”5 Yet, they’re apparently willing to risk the unknown consequences of releasing a GE species into the wild anyway. Unfortunately, they have a history of throwing the precautionary principle to the wind, such as their recent approval of fast-growing GE salmon, the first GE animal in the U.S. So it’s very possible they could next approve the release of GE mosquitoes. To achieve this feat, Oxitec has inserted protein fragments from the herpes virus, E. coli bacteria, coral, and cabbage into the insects, dubbed OX513A. The GE mosquitoes have proven lethal to native mosquito populations. The potential exists for these genes, which hop from one place to another, to infect human blood by finding entry through skin lesions or inhaled dust. According to Alfred Handler, a geneticist at the Agriculture Department in Hawaii, mosquitoes can develop resistance to the lethal gene and might then be released inadvertently. Tetracycline and other antibiotics are now showing up in the environment, in soil and surface water samples. These GM mosquitoes were designed to die in the absence of tetracycline (which is introduced in the lab in order to keep them alive long enough to breed). They were designed this way assuming they would NOT have access to that drug in the wild. With tetracycline exposure (for example, in a lake) these mutant insects could actually thrive in the wild, potentially creating a nightmarish scenario. However the moths, which were the first crop pest to become resistant to DDT, are quickly becoming resistant to chemical pesticides, leaving researchers looking for other avenues of control. The Oxitec moth is similar to their GE mosquitoes in that the females are engineered to die before reaching adulthood. This means eventually the species dies out because it can no longer reproduce. The GE moths have already been laboratory tested in the UK and “caged” field trials took place the summer of 2015 in New York. During those trials, the moths were released outdoors in a contained area. Further trials are planned for spring 2016 with open field trials potentially coming in the summer. This would be the first experimental release of GE insects on U.S. soil. “We’re worried about what the effects of these trials outside of the cages [will be],’ said Liana Hoodes, policy adviser at the Northeast Farming Association of New York (NOFA-NY), citing concerns that the GE moths could spread beyond their trial sites and begin appearing on private growers’ farms. Along with GE mosquitoes and moths, Oxitec has created GE fruit flies, which also contain genes that prevent females from reaching adulthood, preventing the species from reproducing. In Australia, the Mediterranean fruit fly, or medfly, is one of the most common pest species. The Department of Agriculture and Food in Western Australia plans to conduct an indoor trial assessment on the use of GE fruit flies for pest control in the country. Neil Morrison, lead researcher for agricultural pest control at Oxitec, told Reuters that the GE insects could pave the way for pest control methods that are non-toxic and pesticide-free,15 but what it really amounts to is a massive experiment that, once started, cannot likely be undone. When releasing insects with a “self-limiting gene” into the environment, for instance, the species’ population could significantly decline or even become extinct. In 2009, Oxitec released their GE bugs onto Grand Cayman Island in the Caribbean. The experiment will go down in scientific history as the first release of GM insects that could bite humans. Not surprisingly, it was conducted in secret.Once the locals got wind of this, they responded with a fair amount of public outrage — and rightly so! But it didn’t stop there. Oxitec subsequently released their frankenskeeters in Malaysia, Brazil, Panama, India, Singapore, Thailand, and Vietnam. Oxitec is also the creator of GE pink bollworm moths, and swarms of this creature have already been unleashed over the fields of Arizona in an effort to overtake natural bollworm populations, another pest. At present, the use of GM insects is in its infancy. Not only are there no precedents from which to draw potential ecological consequences, but also proper risk assessments have not been done – and quite possibly might be impossible to conduct, considering the many unknown aspects of tinkering with DNA and allowing it to mingle with other species. “The effects may occur in two phases: a transitory phase when the focal population changes in density, and a steady state phase when it reaches a new, constant density … Our methodology reveals many potential effects in each phase, perhaps most notably those dealing with immunity in the transitory phase, and with pathogen and vector evolution in the steady state phase. Importantly, this framework identifies knowledge gaps in mosquito ecology. We’re already seeing the unintended consequences of GM crops popping up. “Super weeds” and increasingly resistant pests are rapidly spreading and wreaking havoc across American farmland, while the human health concerns keep mounting. When scientists take genetic modification even further, tinkering with genes in insects and animals, the consequences may be even steeper. When a Purdue University computer model tracked the effects of releasing just 60 “Frankenfish” (GE salmon) into a population of 60,000, there was a complete extinction of the normal fish in just 40 fish generations. A Change.org petition is calling for the FDA to reject the release of GM mosquitoes in the Florida Keys. You can sign the petition now to voice your support. This entry was posted in E Patient Health Care, Human Behavior, Introducing, Lifestyle Health, Medical Studies, Tele-Medicine and tagged E-Patient Health Care, Frankenfish, GE Insects Have Already Been Released, Gene Drive’ Technology, Genetically Engineered Mosquitoes and Moths, genetically modified foods, Glaring Concerns Surround GE Mosquitoes, human health concerns, Oxitec’s GE Moth, Ready to Spread Like Wildfire, transmitting malaria to humans, Unleash Monsters by Admin. Bookmark the permalink.